While their counterparts take the written form of the Freshman Essay Evaluation this morning, over five-hundred freshmen have already taken the test online via the world wide web for the first time this summer. Twenty-nine percent of those taking the FEEonline passed, according to Leslie C. Perelman, associate dean and director of the writing program. Fifty-six percent did not pass and an additional 15 percent did not pass with a writing subject recommended. Last year, 21 percent of students passed the FEE. "This had been an experiment that had been proposed for a number of years," Perelman said. In previous years, all students who had not satisfied the phase one writing requirement by receiving a five on the Advanced Placement Examination in Writing and Composition would sit down for a timed test that lasted three hours and consisted of two writing tasks. Students taking the FEE today will see the same format. In contrast, the online evaluation gave students a total of 48 hours to write their essays. In addition, one of the essays was passage based. Students could access the passage on one of three designated Wednesdays in May, June and July at 5 p.m. On the following Saturday morning, they were posed an essay question based on the passage. Essays were due Monday morning. Students were also allowed to consult additional resources in writing their essays. "We didn't prohibit them," Perelman said, "We encouraged them not to." The passing rates for the online version of the test and the written test from last year are similar, however. "What is interesting is the distribution is roughly the same," between the two tests, Perelman said. However, "One of the things that we noticed is that the best students did really well," Perelman said. "The top essays were really outstanding." Although the percentage of students passing in the online evaluation is up from previous years, the numbers may be misleading since about 70 students took the FEE online before receiving AP scores which would have exempted them from participation, Perelman said. "In general, about 25 percent have passed [Phase 1] either through the FEE or AP," Perelman said. Although there was significant participation in the online version of the FEE its first year, the program itself was a pilot - the results of which will be studied in the coming year to determine whether the FEEwill be offered online permanently, Perelman said. Perelman, who will report to the Committee on the Writing Requirement about the results of the FEEonline said he will assess any disparity between those taking the FEE online and in written forms. "We have a lot more analyzing to do," Perelman said. However, the question of what it would take to put the FEEonline for an entire incoming class has largely been answered. "We've shown we can do that," Perelman said. Many more freshmen participated in the pilot program than organizers anticipated. "It worked. We had many more students than we expected," Perelman said. One of the reasons for moving the FEE online was to improve its validity, Perelman said. "The kind of test we gave is called a timed impromptu. It's not as valid a measure of the kind of writing done in the real world,' Perelman said. 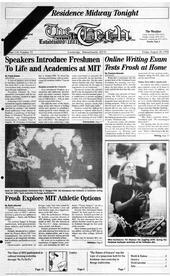 Another reason was to decrease the pressure of Orientation by giving the students the option of not having to take a test they would most likely fail during their first few days at MIT, Perelman said. In addition, students were in favor of the given detailed feedback from graders on what they wrote thereby "transforming it into an educational experience," Perelman said. Students had mixed reactions to the online version of the FEE. "I think I do better on timed tests," said Andrew S. Crane '02, who took the FEEonline in its third session. "I realized I would have felt more comfortable doing it sitting down for two hours," said Amanda M. Bligh '02. Others appreciated the extra time afforded them to write their essays. "I thought it was really really valuable to take the pressure off and be able to get a reflection of your real writing skills," said Timothy M. Gorton '02. "I think I had a much better experience on the web"
"It's more realistic of the writing you are probably going to have in college," said Rayka Yokoo '02. However, the first launch of the FEEonline was not without glitches. According to Perelman, about twenty students had trouble getting to the secure web site and could not take the test online. "No one I talked to who used Internet Explorer could get it to work," said Victoria K. Anderson '02. Internet Explorer does not support the method of obtaining personal certificates that MITuses.